Ever since I was a little girl, I have often felt like I was different. It always seemed that nobody truly understood me, and I wasn’t sure why. As a result, I often ventured into my own rich, inner world, spending endless hours gazing out the windows of my secret hideaway- the enclosed front porch of our two-story home. For me it was a treasure trove, full of old paintings, momentos and knick-knacks. As if the fantasy of finding treasure there weren’t enough, it was also were my mother kept her ‘hope chest,’ which opened up like a treasure box and was filled with her beautifully beaded and sparkly wedding gown and shoes. I looked at all of these things with wonder, but was careful never to disturb anything. Most of the time I spent in this little nook was during the summer months, because it wasn’t insulated. At one end of the porch, was the back side of our huge air conditioner in the window between the porch and our living room. This was the exact location I liked to settle down in when I was on the porch. Why? Well, first, the windows between the living room and the porch served as a sort of secret passageway from the house to my secret space. I liked the idea that I could slip into the house without notice, just appearing from behind the curtains mysteriously and sometimes would use this to cheat at hide-and-seek with my brothers. Second, the warm air and splendid hum from the air conditioner gave me a feeling of comfort and seclusion. I set up my ‘play’ kitchen table and chairs there and paint, draw and write stories. Oh, and right next to my table and chairs, was my ‘throne,’ which was actually a twin pull-out bed that was folded up into an ottoman, covered with a very 70’s-looking rose patterned slipcover, complete with ruffles all around the edges. I’d sit on it and pretend to be a queen. 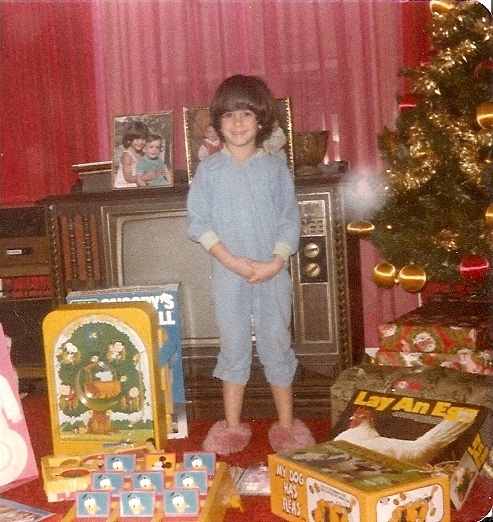 Me at age 5, standing in front of the windows (behind the tv) to my secret hideaway. Notice all of my nifty Christmas loot! When it came time for us to move into a new house, I was heartbroken. I did not want to leave my sanctuary, and even waited until the last minute to pack my things because I was certain I’d never be forced to leave this wonderful place. The adults had other plans. They didn’t see the wonder and splendor of my corner of the front porch. They saw clutter, and a chance to move to a nice, new place that would be better for all of us. I can honestly say that no other place I’ve ever lived (with the exception of my college dorm room) has ever been the sanctuary that my first house was for me. My sense of happiness and belonging had always been heavily dependent on how I felt in my surroundings. A tiny corner to call my own, along with regular periods of solitude were the keys to my comfort level. Little did I know that later in my life, my idea of hearth and home would be shaken, as if the rug were being pulled out from under me. We arrived in San Antonio on July 29, 2006. I didn’t have much in my pocked except for my last paycheck and some money that my Mom sent me here with to start my new life. I managed to get myself a car, and within a couple of weeks was hired as a job as a Marketing Specialist. All right! I’m on my way now! Well, not exactly. About seven months later in March 2007, I was laid off from my job. I was in uncharted waters with no idea of where to go from here. So, I did the sensible thing. I filed for unemployment and continued to look for work, feeling for the first time that everything might not be okay and that I may have made a terrible mistake. In June 2007, I enrolled in Massage Therapy school, while I searched high and low for marketing jobs. I thought I had everything under control. A month later, we flew back up to Massachusetts and got married on Cape Cod. Before I got all the way back down the aisle after the ceremony, I learned that my new stepson had decided he wanted to live with us. This was a whole new can of worms. Given the situation we were in, I knew that this would mean financial ruin, but I also knew this wasn’t a battle I would be able to win. I chose to accept the situation and do the best that I could with what I had to work with. So, not a full month after the wedding, my stepson moved in with us and we had to move to a larger (more expensive) apartment. By January I had finally graduated and received my license in Massage Therapy. I started working full time as a massage therapist. Since I had not found a marketing job, this was the only other card I had to play and with the financial issues brewing, I had no other options. Unemployment was nerve-wracking, but transitioning into a new career was almost just as bad. I had gone from a nice salary with a 401K plan, health, vision and dental benefits to a commission-based job with no hourly compensation and no benefits- including no sick time. Now, any person who does physical work knows that there are times when you push too much and injury is inevitable. Without paid time off, recovery time means taking a major hit to the wallet, and with the number of hours it takes to get a decent paycheck, injury is always a looming threat. Meanwhile, as I was getting used to this transition, the daily arguing regarding how to integrate our new family and raise this 10-year-old child hit a high. Everything from establishing rules and limits to making my husband understand that pushing a child to reach his full potential isn’t cruelty took its toll on me. I was the wicked stepmother who dared to suggest that our boy could do better than Cs and Ds and took away video game priviledges as punishment for silly things like telling lies or throwing a tantrum. I was mentally, emotionally and physically exhausted by all of this change. It came to a head in March 2009 when my stepson came back from Spring Break and tearfully told us he wanted to go back to live with his mother. I knew that all of my hard work and sacrifices would be for nought as soon as he got on that plane. I cried. I cried a lot. How much more of this could I possibly endure? My world, my identity, and my spirit were all crushed. It wasn’t until this past week when I spontaneously returned to Boston for a mini-retreat with some of my longtime friends that I finally surrendered to all of my mounting emotional pain and let it all out. I came home confused and filled with doubt about my future. I convinced myself that I had no idea what I was doing, and it was time to throw in the towel. Then came Wednesday night. A few months ago, I enrolled in an online class by Sonia Choquette, a wonderful author whose books have helped millions of people understand the importance of their soul’s voice. The course offered several conference calls with Sonia, which gave the participants the opportunity to get some brief one-on-one readings with her. This was the final call. At first, I thought I might not even bother because so much of what people seemed to be asking was unrelated to what I was going through. But something about this time was different. I distinctly got the feeling that if were able to get in on this call, I’d be chosen for a reading. The first obstacle was how to participate at all because I was scheduled to work Wednesday night. This doesn’t necessarily mean I’m booked solid, but you never know. Never underestimate Spirit’s ability to make something happen if it is meant to happen. Since my return from Boston my shoulders and neck were a wreck from sleeping on a pull-out bed and being crammed into airplane seats. No matter. Remember, I was brought up in a Catholic, Italian family. Suffering is part of our work ethic! I figured I’d go as far as I could push myself, and then call the chiropractor! I guess I was more kinked up than I thought because I had only done two massages and it was really killing me. I had no choice but to stop, otherwise I would have been in trouble. I thought, “who would’ve thought that being in pain would help me get something accomplished?” After my shift, I pulled out the cell and dialed in to see if I could jump on– five times! It kept telling me that my conference code wasn’t valid. Now I was getting disappointed because even though I was in pain, the sense of urgency to get on this call seemed to intensify. Finally, after getting into my car and pulling out the printout of the email that was sent, I realized my code was one number off, and even though it was already 10 minutes into the call I decided to give it a try. There are only so many callers that are able to get through, due to the number of lines available. I thought for sure it was all over for me. Just before I made that last call I called my best friend from home and gave a heavy sigh. “I don’t know if I’ll be able to get on now because it’s already so late. And I really felt that I was meant to be read if I got through tonight. ” She could probably hear my pout as we hung up, and I tried one last time. You guessed it, I got on the call. I listened as I got home and made my dinner, settling down on the couch and wondering if technology was on my side. I had to virtually raise my hand to ask a question by pressing *2. I ate dinner and waited. Oh yeah, and I took a LOT of ibuprofen. Just when I thought it was all over for me, I heard the host announce a call from San Antonio, but they didn’t say my name. It was a man’s name. Just then I realized it was me! The phone line is in my husband’s name, so that’s what came up on their monitor. I quickly acknowledged that it was me, and asked my question. To my surprise and with very little to go on, Sonia gave me the exact information I needed to hear in that very moment. The only thing I told her was that I had moved from Boston to San Antonio three and a half years ago which had turned my life upside down and I wanted to know what I had to do next in order to make things right again. She told me that I had lived many lifetimes feeling like I was an outsider, and this life had the same theme. She went on to tell me that although I feel like I am different from everyone else and I can’t seem to find ‘my tribe’ that my intention was to come here and break down the artificial barriers and find common ground with people. And the only way to do this, was to introduce a more profound perspective on life that is more spiritual and transcends outward appearances. She explained that even though I feel like a fish out of water, that she feels that I’m actually doing a very good job of this, but to be prepared that whenever I begin to feel comfortable in a place I will be moving again. This took all of 2 minutes, but left me with a profound feeling of peace that I cannot express in words. All of the guidance that I had been receiving was completely validated, and the doubt removed. Why did I think that just because I was on the right path that things would happen MY way? She confirmed what my soul had known all along,- that our true selves are hiding beneath all of the false appearances we put forth. Underneath it all, we are just spirits trying to understand what it means to be human. Not only that, but if you have read previous posts, you know that the answer my guides have been giving me about where I belong has been the concept of a ‘gypsy.’ She didn’t use the exact word, but she confirmed that my life’s purpose means that I’m never going to stay in one place. It’s not my comfort zone, or my idea of ‘home,’ but it is exactly what I need to accomplish my goal in this life. I’m my own Kokopelli, traveling from one tribe to another, bringing my stories and uniting people on a spiritual level so we can remember that we all come from the same soul. I am so lucky to know my purpose here, and I intend to honor that purpose by continuing on my path. There’s no place like home, but we all carry a piece of home with us. That piece of home is our soul. When we feel out of sorts or out of place, all we need to do is stop, take a deep breath and remember that we are here with a purpose. We will all return to the comfort and security of our true home one day. In the mean time, remember that you are not alone, and the signs of this are all around you. Keep your eyes and your heart open and don’t be afraid to reach out to people. Chances are, you will see a spark of yourself in their eyes….if you look beyond appearances. Oh, and the next day I was able to get in to the chiropractor and after a very intense adjustment and a full day of putting ice on my shoulder, I’m good as new! ~ by healingstarspirit on March 25, 2010. Keep on trucking–what was meant to be will show up when the time is right. Remember how much you have helped me in my journey’s. Do you really think that it wasn’t chance and divine intervention that we met through my husband and have become fast friends? You have helped me immensely through massage and your other gifts.